Complete collections from today’s most popular fabric designers. See Website Coupon: Save 20% TODAY on all Joel Dewberry fabrics! I cannot describe in words how much I love QuiltHome! The fabrics always come so fast, and I love the handwritten note that comes in the carefully wrapped bundle of fabrics. This is the only place online I will ever buy fabric!!!! Thank you! My parcel of fabric arrived last week while I was away on a few days leave. What a wonderful surprise to come home to and to open the parcel and spread my purchases on the bed. I am thrilled with the choices that looked even better than they appeared on the website. You guys are the absolute coolest. Jennifer Paganelli has just released a fabulous new fabric collection, Poodle, and three new patterns—just in time for summer! Poodle is one of our favorite Jennifer Paganelli fabric collections so far. It has a great mix of print designs and scales, and gorgeous, bright colors. Her new patterns are sure to be a hit as well. Boxer shorts for adults and children (see the adult version above), and a great new top/dress for women which can be both casual and jazzy. And best of all… they are all wonderful in Jennifer’s Sis Boom fabric lines! 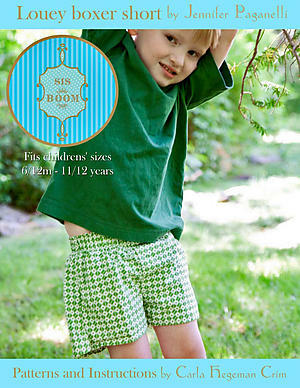 Check out Jennifer’s Louey Boxers (below left) for kids—great casual shorts for boys and girls. Her Marlo Top and Short Dress (below right) is an adult version of Jennifer’s oh-so-popular Cathy Top and Dress. Click here to get all the HTML you need to add one of these links to your blog or website! And remember to enter your page in the Link-of-the-Week contest using the email link above! Use coupon code PAG25 to save 25% off all in-stock Jennifer Paganelli fabrics & ePatterns Quantities may be limited Coupon expires 11:59 p.m. PDT on Monday June 28, 2010 Enter the code in the box on the payment page when you are checking out and remember to click the Redeem button. Coupon must be entered at time of purchase and can not be added later. Only one coupon can be used per order. Check out our specials section — 20% to 70% off selected fabrics! We carry Amy Buter Quilting Solids, Free Spirit Designer Solids, Moda Marbles (above), and RJR Handsprays. Meghann Sheridan of Dearborn, Michigan A $50 Shopping Spree winner will be announced in each Newsletter. To be eligible, you must be registered on QuiltHome.com and have logged into QuiltHome.com since our last newsletter. Winner must claim Spree within 14 days of that Newsletter’s publication. Please add No-Reply@QuiltHome.com to your address book/safe senders list to ensure that you receive these important messages in your inbox (not your bulk, spam, or junk folders).